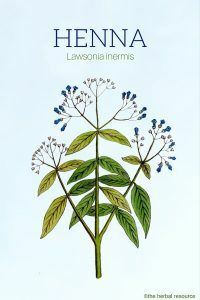 Other Common Names: Jamaica mignonette, al-henna, Egyptian privet, henne, mehndi, smooth lawsonia, henné (French), hennabuske (Swedish), Henna-Strauch (German). Habitat: Henna is endemic to Southwest Asia, North Africa, and India, but has also become naturalized in warmer parts of South and North America, Australia and the West Indies, where it is often referred to as “West Indian Mignonette”. Henna only thrives in temperatures of + 13 ° C or higher. At temperatures below + 5 ° C, the plant can not survive. Today, henna is cultivated commercially on a large scale, especially in India, Pakistan, Morocco, Yemen, Iran, Afghanistan, Somalia, Sudan, Libya, Egypt, and Bangladesh. Henna is often used as a hedge plant because of its beautiful appearance and the fragrant flowers. Description: Henna belongs to the Lythraceae family (a family of flowering plants that includes 620 species). 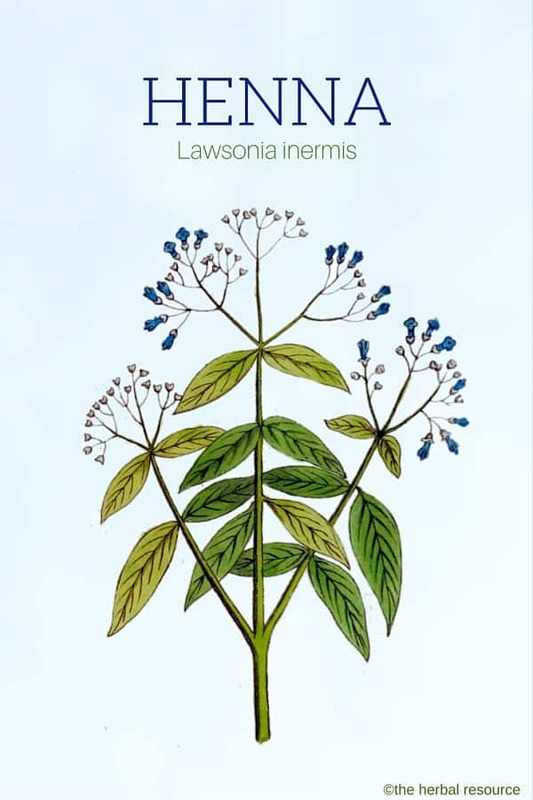 It is the only plant species in the genus Lawsonia. Henna is a thorny evergreen shrub that can reach up to 6.0 m in height. It has dark green, narrow elliptical and tapering leaves that are approximately 5 cm long and have a tea-like aroma. The fragrant flowers are whitish or pink to brick red and sit in a pyramid-shaped inflorescence. The fruit is a blue-black berry. Plant Parts Used: It is mostly the leaves of the plant that are used as medicine and dye but the bark and the essential oil extracted from the flowers have also been used to some extent. The leaves should be collected from plants that are about three years old, dried and ground into a powder. A cultivated area of one hectare can annually yield around 1.5-2 tons of plant material. The flowers should be collected early in the morning and then distilled to extract the oil. The bark is collected from cut down branches when needed. 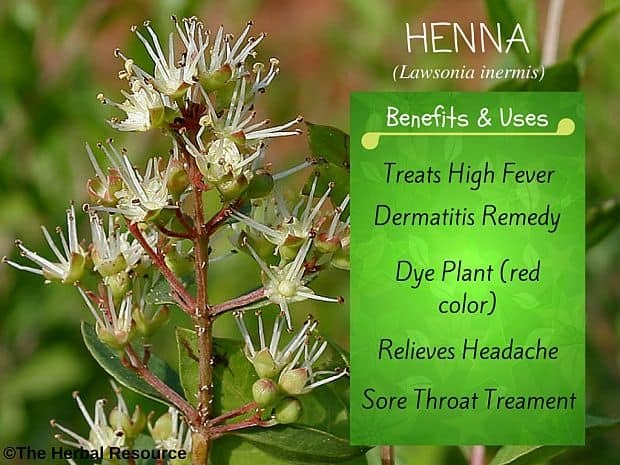 Henna contains naphthoquinones, most importantly lawson (2-hydroxy-1,4-naphthoquinone), also know as hennotannic acid (1% in the leaves, a little more in the stems and stalks). It is this substance that gives henna its dye properties. Henna also contains tannins (up to 10%), coumarins, flavonoids, phenolic acids, sterols, and xanthones. All of these substances may be responsible for the plant’s medicinal properties. The astringent properties are due to the content of tannins. The name henna also applies to the dye prepared from the plant. Henna is a very ancient, oriental dye used to color hair, beard, eyelashes, nails, and skin. It is probably one of the oldest decorative cosmetic preparation know to man and is still widely used as an ingredient in many cosmetic products and natural hair dyes. In Egypt, ancient mummified remains have been discovered where nails and fingertips were dyed with henna. In addition to color hair and skin, it was also used to dye the mane and tail of horses. In Arabia and India, the herb has been used to paint the fingers, palms, and feet in intricate patterns usually with some religious significance. It was first introduced to Europe in the late 1800s. The leaves are widely used for hair coloring. The powdered leaves are mixed with water to form a porridge which is applied to the hair. Henna on its own gives red or auburn color. Mixed with a deep blue dye extracted from the plant indigo (Indigofera tinctoria) numerous tones ranging from brown to black can be obtained. The essential oil is obtained from the flowers by distillation and it is used as an ingredient in many oriental perfumes. The fragrant oil, also known as Mehndi oil, is used during religious festivals in India and Africa. The oil should also have been the source of Cleopatra’s seductive perfume, Cyprinum, which was used to moisten the sails of her ship before she sailed out to meet Mark Anthony. Despite that henna has primarily be used as dye plant, it is also know for its medicinal properties. The leaves are used in traditional folk medicine in India, many Muslim countries and North Africa. The herb is used in Ayurvedic and Unani medicine as a gargle for bad throat and extracts or decoction have been used as herbal remedies for diarrhea, amoebic dysentery, ulcers, tapeworms, and fever. A decoction made from the bark has been used to treat some liver diseases. 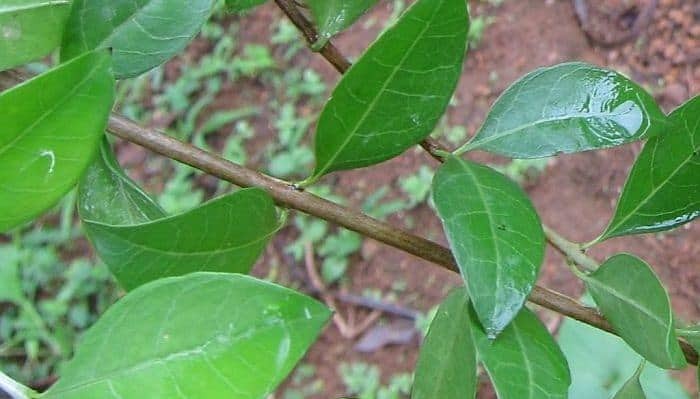 Externally the leaves, due to their astringent effect, have been used to treat high fever, headache, joint pain and dermatitis. As a treatment for a headache or fever, the dried leaves are mixed with water in order to make a paste that is then applied as a compress on the forehead. In the Middle East, henna is an ingredient in eye lotions and antirheumatic liniments. Many skin disorders are often treated with the herb, including eczema, fungal infections, injuries, wounds, burns, boils, acne, herpes, and scabies. To dye the hair black the herb can be mixed with indigo in the ratio 1: 3. Moisture and some heat are needed to achieve the optimal color reaction. Henna should not be used during pregnancy and lactation. The widespread use of it as a dye has led to more and more people experience allergic reactions, but these reactions can also be caused by other substances used along with henna, especially p-phenylenediamine used to obtain black color. This substance has been banned for use on skin in many western countries, but it can be difficult to control if it is present in hair dyes or tattoo color. Those experiencing an allergic reaction to black dye like itching or blistering, should consult a doctor and report that they might have applied p-phenylenediamine on the skin. Hypersensitivity to it can last a lifetime, and once people have become sensitive or allergic to it, any use of synthetic coloring agents may become life-threatening.